I've done an awful job describing this game, because it's so vast that I'm barely seeing a toe of the body. So let me try to add some general information that might be useful to you. First off, and this might be the most important thing I'll mention: Rebel Galaxy is a masterful piece of design. Information is readily available, and in logical places, but it is not always complete information. So don't reveal absolutely everything to the player, but make it easy to access what you do reveal. The interface becomes very familiar very quickly. That might not sound like much, but the interface is how the player interacts with a vast, sprawling universe. Any janky element in the interface would inhibit that interaction, but as far as I can tell (after 10+ hours), the interface is a round, smooth, stone. I think there are plenty of developers who can get an interface to 80%. There are very, very few, though, who are willing to spend the time to get it absolutely, entirely right. Like I said earlier this week, Rebel Galaxy was designed from the ground up for use with a gamepad. In that sense, the interface complexity has a natural limitation, and that's a good thing. Creating a highly complex, dynamic world, then enabling the player to interact with that world via an interface of reduced complexity enables the player to more readily experience the world. 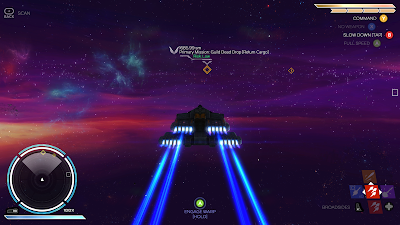 The interface in Rebel Galaxy quickly becomes relatively transparent, so instead of thinking about what button to press, the player directly experiences the game world. Complexity can also be customized, to a degree. As an example, consider combat. For every piece of mounted hardware on the ship, it's possible to customize its behavior. Want to go entirely manual in combat? Have at it. Want to manually control a few turrets in combat, but not the mining laser? Okay. Want to basically have every weapon set to fire when in range, with the player focusing on flying the ship? That's okay, too. All right, let's veer wildly from interface and user-friendliness to---the soundtrack. I believe that, in almost every case, the phrase "more slide guitar" is true. And there is some fantastic slide guitar in the Rebel Galaxy soundtrack. Very "Outlaws" inspired at times, and very rakish in general. Plus, and this is very cool (PC version only), you can play a custom soundtrack of your own music. That's still a very incomplete picture of the game, but I will say, with no qualifications, that this is a dynamic, wonderful game. It launches on Tuesday, and here's the Steam page: Rebel Galaxy.